Each northern hemisphere winter, from November 2013 to April 2016, we spent five months in Montevideo. As a Uruguayan tourist visa only allows for a maximum stay of 90 days, we had two options; we could either request a once-only ‘prolongación‘ of a further 90 days at the immigration office (Dirección Nacional de Migración), or we could leave the country and return, same day if we wished, whereby we would be granted a new 90-day stay. We have done both. The most convenient way of crossing the Uruguayan border was to take the ferry from Montevideo to Buenos Aires. In March 2014, we chose to travel with Buquebus, an Argentine company, which operates ferry services between Buenos Aires and both Montevideo and Colonia, and also has a fleet of coaches in both Argentina and Uruguay. Our ferry was the ‘Francisco‘, one of the fastest in the world, capable of travelling at up to 107 km/hr, with 1024 passengers and 150 cars. Compared with all the hassle of air travel and airports, international travel by ferry is both comfortable and relaxing. I was very much looking forward to going to Buenos Aires. In late 1984, when my project with Bank of America in Lima was completed, my next assignment involved my moving to Argentina, where BofA had recently acquired a large retail bank. The BofA HR department handled all the paperwork for the application for my work permit. Unfortunately, in that era, I was travelling on a British passport and the Americans did not seem to realise that that might prove to be a problem; it was not long after the Falklands War and UK citizens were about as welcome in Argentina as pork chops would have been at a Jewish wedding. My application seemed to disappear into a black hole and we could get no feedback. After two months of waiting and marking time, I unexpectedly received an attractive offer for a senior management position with a computer services company in England. I accepted, but that is a story for another day. When I finally got to Buenos Aires, I confess that I was rather disappointed. At the ferry terminal, locals warned us not to leave the terminal and to only take a certain type of taxi; apparently there were a lot of muggers in that area and many of the taxi drivers were less than honest. And later that afternoon, within ten minutes of leaving our hotel, in a bar in the square outside, a young tourist at the next table was robbed and a crowd set off after the thief. Compared to the relative security of Montevideo, Buenos Aires seem to have its problems. We were staying beside the Plaza del Congreso, about 2 km from the Casa Rosada and the waterfront. For the next eight days, we walked all over the inner city. Although we found parts that were clean and well taken care of, with small parks, in general most of the city was grubby and had seen better days. The pavements were narrow with irregular surface, the streets full of traffic, and every doorway seemed to be replete with smokers; at times the pollution was very noticeable. And not a day passed without parades of protesters with their banners and chants, accompanied by heavily armed riot police. Buenos Aires seemed to be a city in stress. In comparison, the waterfront area was a welcome contrast, with its wide walks, fresh air and interesting modern architecture, with several very large parks. We returned to Uruguay as we came, by Buquebus, but this time by the relatively short crossing of 1:15, to Colonia del Sacramento. It was noticeable that the water was thick with silt and occasional tree trunks; it looked more like a ploughed field than a river. Colonia was founded in 1680 by Portugal, to protect its southern border with Spain. But the Portuguese were repulsed by the Spanish later that same year. A treaty between Spain and Portugal, signed the next year, returned Colonia to Portugal. Colonia changed hands no less that nine more times until the founding of Uruguay in 1828. Colonia is renowned for its historic quarter and is a UNESCO World Heritage Site. One can find whole streets with Portuguese architecture and others with Spanish. And with streets and pavements of cobbled stones, just as one can see in the villages and small towns in Portugal. From Colonia, with our new 90-day visas, we travelled back to Montevideo, once more by Buquebus, but this time on the highway. When we got back to our little apartment, it felt as if we were home again. We spotted the notice on a lamp post, inviting owners of salchichas (dachshunds) to a gathering in a park by the river the next afternoon, starting at 14:00. It was being organized by a Facebook page called Salchichas Uruguay. As we passed that park on La Rambla nearly every day, we decided to go that way the next day. We had lunch in nearly Punta Carretas, and headed for the park. Even if we had not already known where the park was, all we would have had to do was to follow the stream of salchichas, all heading in the same direction. And when we arrived at the park there were already a multitude sniffing each other, barking, yapping, growling, lifting their leg, and vacating their bowels. And that was just the dog owners. The Facebook page had about 1000 members at that time and the organizers had expected 50-100 owners to turn up. They were quite overwhelmed by the response, and by the end of the day over 400 dogs had attended. There were only two requirements for the owners; all dogs had to be kept on a leash and no females in heat were welcome. I could imagine the ensuing chaos if an owner had not respected the second requirement. It would have been comical to watch. During the afternoon there were gifts handed out, a raffle was drawn, and prizes were given for the best dressed dog. Every day we saw many dogs on La Rambla, most not on a leash, despite the busy traffic on one side. They seem be well trained and responsive to the owners and I have never once seen two Pocitos dogs growl or fight. Many run with their owners, and I have even seen one that swims along parallel to the beach, while the owner strolls along, usually talking on his phone. There are many owners, perhaps older citizens, who employ dog walkers to exercise their pet. Over the three summers that I have been in Pocitos, I have got to know two of the many dog walkers, one who specializes in small dogs, and the other in large dogs. They told me that the maximum either have taken at one time is 14-16 and the guy who takes only large dogs is built like a weight lifter. His own dog is not on a leash, and trots ahead and stops at each light, until it is told it can cross. It is amazing to watch the human-to-dog communication. We also saw dog walkers in Buenos Aires, but the ones that we saw were wearing special belts, to which they snap the leashes, leaving their hands free and eliminating the risk of a dog escaping. In Mendoza, we saw many street dogs, especially in the park. In no way were they aggressive; they were more a nuisance, in that they wanted to be adopted, and they insisted in following one everywhere. My eldest son, Andrew, had a similar experience in North West Argentina, where street dogs followed him and his friends from where they were staying, when they went hiking in the nearby foothills of the Andes. We also saw many street dogs in Santiago de Chile. To cross a busy street, they sit at an intersection, waiting for the lights to turn green. Sometimes they cross with people, at other times by themselves. In English the expression ‘leading a dog’s life’ can have two diametrically opposed meanings. On the one hand it can mean something that is pleasant – the good life: pampered, well fed, warm, comfortable. But it can also mean something that is unpleasant – a rough life: sleeping outside in all weathers and surviving on scraps. In our time there, we saw very many examples of both extremes. Mendoza is in the foothills of the Andes, on the main road that runs from Buenos Aires to Santiago de Chile. It was totally destroyed in 1861 in an earthquake measuring 7.2 and of its population of 12,000, an estimated 4300 were killed and 750 injured. The city was rebuilt in a nearby location. The rebuilt city has a 6×6 block core, with plazas on each of the four corner blocks and a huge 2×2 block central plaza, known as Plaza de la Independencia. Each of the plazas is well shaded by massive trees, that were probably planted during the redevelopment. From my window beside the Plaza de Chile, I can see a huge hawk on the topmost branches of a huge coniferous tree waiting for its even larger parents to return with dinner. There are reputedly at least four hawks resident in this plaza. I suspect that they keep the local pigeon population well under control. In Montevideo and here in Mendoza, it is not unusual to see jugglers performing at busy junctions. As soon as the lights change, they perform and then dart alongside the traffic, collecting contributions. Many of the characters are remarkably talented. But here in Mendoza I witnessed an unusual act at an intersection; a couple dancing tango to their own musical accompaniment. Not only were they talented, but the presence of their baby in a pram on the pavement raised the poignancy of their performance: not only were the drivers contributing but also people passing by on the pavement. A little while later I saw the couple sitting on a bench in the park, the mother breast feeding the baby. I suspect that they would have an interesting story to tell. 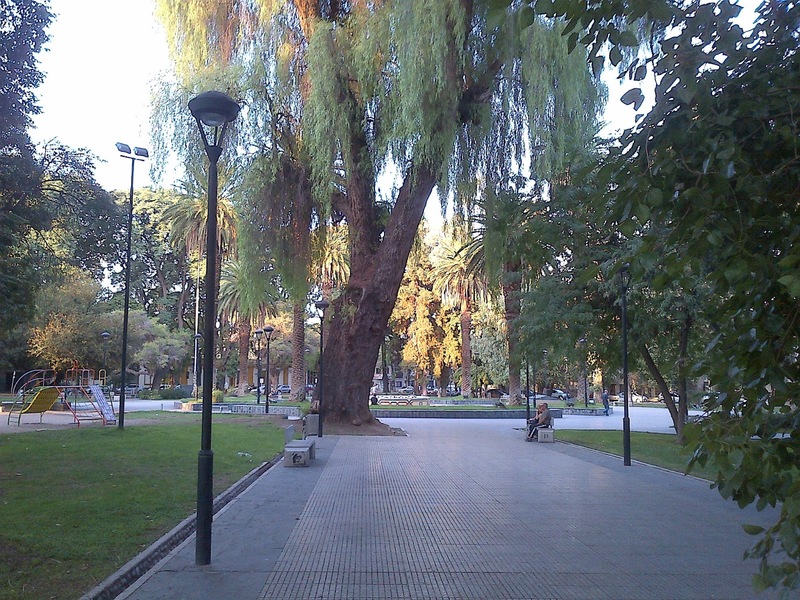 About a twenty minute walk to the west of the Plaza de la Independencia lies the Parque General San Martín. With almost 400 ha and 17km of roads and paths, it is one of the largest park areas in Argentina. The park contains a zoo and an open air theatre, as well as an 800m rowing lake, a football stadium, horse jumping arena, a velodrome, an athletic track, a tennis club and a golf course. And all day long, regardless of the temperature being in the 30s, a horde of runners, young and old, throng the paths. As well as the wide range of sporting facilities in the park, there are several open air restaurants with excellent food and wine. 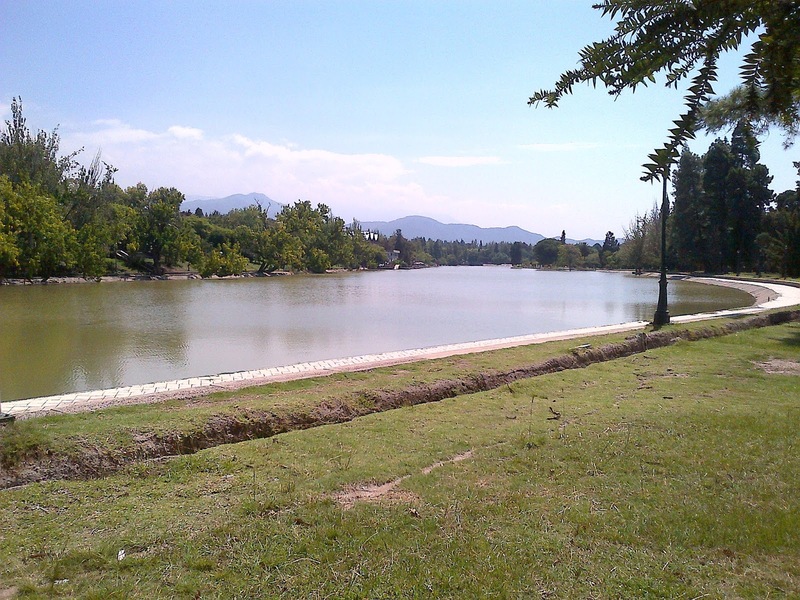 It is not surprising that on each day of my stay in Mendoza, my feet, as if on automatic pilot, led me back to the park.